On 04/11/2016 and for the sixth year running, HYGEIA Hospital hosted the one-day event entitled “Latest Developments in Liver Diseases IV”. The event was organized by the HYGEIA Hospital Hepatology Department, under the auspices of the HYGEIA Scientific Board and the Scientific Union of HYGEIA Doctors. 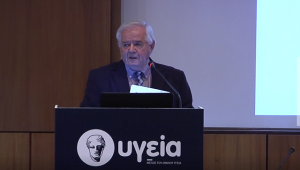 Dimitrios Tsantoulas, Assistant Professor & Honorary Director of HYGEIA Hospital’s Hepatology Department, served as Chairman of the organizing committee. The topics discussed included the relationship between blood diseases/disorders and liver; liver amyloidosis; developments in the treatment of the very frequently occurring non-alcoholic fatty liver disease; contemporary therapeutic strategies in chronic hepatitis C; the relatively new IgG4-related disease, with special focus on IgG4 cholangitis and pancreatitis; the recent application of nuclear medicine in the diagnosis and treatment of the liver; and the relationship between fungal infections and liver. Moreover, two distinguished foreign professors talked about using lab tests for the diagnosis of autoimmune liver diseases and pediatric autoimmune liver diseases.